Their unique Logibet Index gives you all the info you need. Logibet is an up-and-coming tipster service, started in 2015. Their unique "Logibet Index" does not solely rely on the amount profit a tipster produced but takes into account stability and experience as well. You can look at these stats individually too. Stability is especially useful if you look for better short-term results. If you create a tipster account and your Logibet Index reaches 750 you qualify for the "rookie" status and you can start charging other users for your picks. As your index grows you can sell your tips for a higher price. There are five levels: newbie (can't charge for tips), rookie, junior, senior and master. If you click on "Tips" you'll find all the picks for the day from the tipsters whose Logibet Index is over 750. If you reach that threshold your picks will be featured here as well. Under "Pending" you'll find live games to bet on as well as markets which are months away from coming to a result, such as championship winners, managers to be appointed, etc. All free tips pop up in Logibet's "Info Feed" on the front page as soon as someone submits them. If you click on "Tipsters" you'll find the selection ranked by the Logibet Index, but you can sort them by profitability, stability or experience as well, just click on the button on the top of the table. Submitting your tips as a tipster is kind of messy, you have to fill out a registration form again to create a tipster account. Then you can choose an event from the drop-down menus, first, you have to pick the sport, then the country, then the event, bet type, and outcome: if your event isn't listed Logibet lets you write it in. Sometimes you have to select the outcome twice before you are able to proceed: first to preview your tip, then to "send it up". After buying 9 tips Logibet gives you the 10th free of charge. In addition, Logibet occasionally runs special promotions, for example a discount during the 2016 Summer Olympics. You have to check under "Blog" then "Promotions" on the top menu bar to make sure you don't miss out on any extra value. Get 50% off of every monthly subscription in the first month! 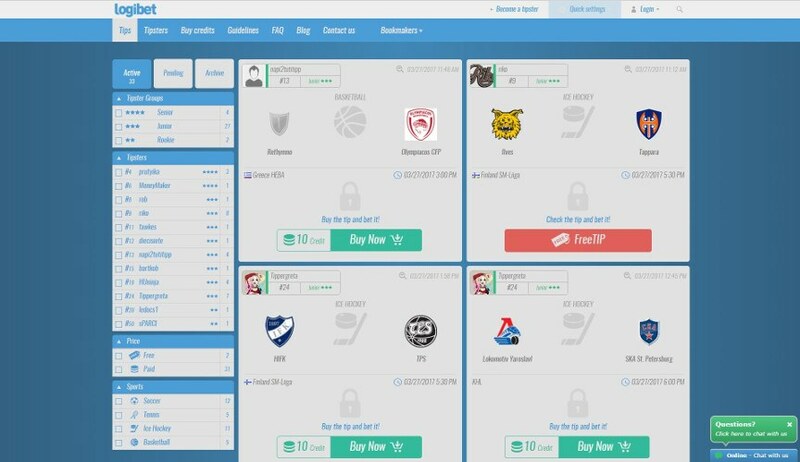 The largest social network for sports betting - with profit guarantee policy. More than one thousand € profit per month!